4Media HD Video Converter - special video editing software designed to transform your video to various high definition video formats like HD ASF Video, HD AVI Video, HD H.264 Video, HD Quick Time Video, HD MPEG4 Video, etc. Daniusoft Digital Media to ZEN Converter - an excellent DRM media to Creative ZEN converter which can convert protected music to Creative ZEN. 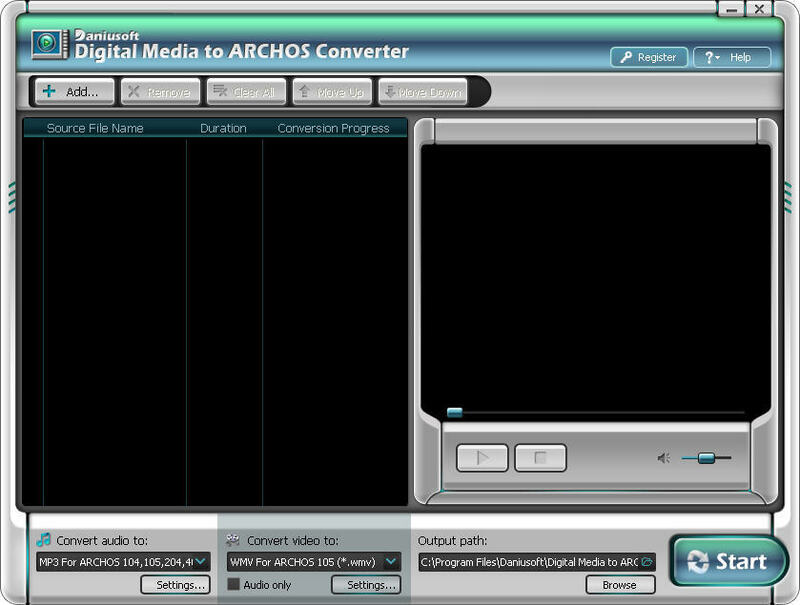 Daniusoft Digital Media to ARCHOS Converter - An excellent DRM media to ARCHOS converter which can convert both DRM audio and DRM video to ARCHOS compatible formats. Aimersoft Video Converter for BlackBerry - Aimersoft Video Converter for BlackBerry can help you easily convert video such as AVI, WMV, MPEG, MPG, DAT, RM, RMVB, MOV, ASF, FLV,etc. to BlackBerry AVI. Wondershare Apple TV Suite -The suite includes Wondershare DVD to Apple TV Ripper and Wondershare Video to Apple TV Converter. Ultra Zune Video Converter - Convert AVI, DivX, XviD, VCD, MPEG, MP4, M4V, MOV, QT, MOD, RM, RMVB, VOB, WMV, ASF, 3GP, 3G2, FLV, H.264 to Zune MPEG-4, WMV video format or Zune WMA, AAC, MP3 audio format. Avex iPhone Video Converter -Avex iPhone Video Converter converts AVI, DivX/Xvid, WMV, MPEG videos (and many more) to iPhone MP4 video format in one simple click. Wondershare Video to Apple TV Converter Convert video to Apple TV video MP4 and audio MP3, M4A,put video files on Apple TV.Convert video to Apple TV with powerful video editing including video cropping and video trimming. Wondershare Video Converter Platinum - Convert video to most popular video formats with powerful video editing including video cropping and video trimming. It supports convert video to various video formats by custom file size and output quality. Avex DVD to iPhone Video Suite -Avex DVD to iPhone Video Suite is a One-click, All-in-One solution to create iPhone movies from DVDs, TV shows and home videos. Wondershare DVD to iPod Converter for MAC - It is an excellent DVD to iPod conversion tool that is designed for Mac OS users to convert DVD to iPod video. Aimersoft DVD to 3GP Converter - A powerful DVD to mobile phone software program for all cell phone users. This DVD to 3GP Converter allows users to rip DVD movies to 3GP and 3GPP for playback on all kinds of cell phones. Aimersoft DVD to AVI Converter - This is a DVD to AVI Converter, convert DVD to AVI with rich options such customizing file size, DVD movie trimming, DVD video crop, subtitle selection, audio track selection and so forth. Wondershare YouTube Downloader for Mac - both a Mac YouTube downloader and a Mac FLV video converter. It can convert YouTube to iPod on Mac, put YouTube to iPhone on Mac, and support all other popular players. iSkysoft iPod Movie Converter 1.5.27 - iSkysoft iPod Movie Converter can convert MP4, MOV, 3GP, AVI, WMV, RM, MPEG, ASF and FLV to iPod touch, iPod classic,iPod nano with very high quality and various output settings. EZuse MKV Converter - convert AVI MPEG to MKV, and convert MKV to among all popular video formats: AVI, MPG, XVID, H264, MOV, QT, etc. iSkysoft Video to AVI Converter for Mac - Convert convert MPEG to AVI, MP4 to AVI, and all other popular video files to AVI for Mac OS X users. River Past Crazi Video for Sansa - a powerful Sansa video converter which can convert AVI MPEG to Sansa, DVD to Sansa Video, and convert ohter popular video files to to Quicktime movie supported by Sansa. River Past Crazi Video for Wii - a powerful Wii video converter which can convert MPEG AVI to Wii, DVD to Wii Video, and convert ohter popular video files to to Wii compatible QuickTime movie files. Naevius Yahoo Video Converter 1.0 - Yahoo Video Converter - Download and convert Yahoo video to the common "avi" format. Naevius GVI Converter 1.4 - A powerful Google video converter program that allows you to convert Google video files GVI to AVI format. Naevius MySpace Converter 1.0 - MySpace Video Converter - Download and convert MySpace video to the common "avi" format. Koobo 3GP MP4 Video Converter 1.4 - Koobo 3GP MP4 Video Converter is a software for 3GP/MP4 file conversion of portable video device such as iPod, PSP, ZUNE, Cellphone, PDA, Pocket PC, etc. Koobo iPod MP4 Video Converter 1.4 - Koobo iPod MP4 Video Converter is a software for iPod MP4 file conversion of portable video device for iPod or other software iPod player.